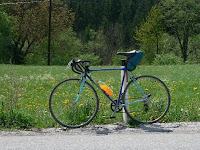 The story of the St Gothard bicyle is not yet finished. The bicycle had served me as a fixie for some time - a very short time to be honest, as I couldn't really identify with the fixie setup. I tried to feel the advertised "mistycal connection of a rider with the road" - but all I got was few more things to worry about: chain falling off, sprocket unscrewing, leggings of trousers geting into the chainring, constant allertness to the traffic and when to brake. Finaly I realised I'm too old to play the hipster and turned the bicycle into a single speed one. It's my main town-bike now. Sometimes it does unusual thing too. Once I rode it through the 2 km track of an cyclocross race. The second time I rode it to the second place that bears its name. It's a little village in Slovenia called - as you may guess, of course - Šentgotard. The place is situated close to a small pass called Trojane, which is probably second bigest tourist attraction in Slovenia, second only to Postojna's cave. Trojane is reknown for its apricot-marmelade-filled doughnuts. Even now, when the highway was built with the tunnel that evades the pass, people still take a turn off to buy the pastries. I made this little trip (40 km each way) one summer Saturday morning. It was a ride of 40000 wheel revolutions. A very nice experience indeed. On the way to Trojane I was accompanying a friend on a road bike and the single speed setup gave me the opportunity to train fast cadence and smooth pedaling technique. A nice little workout on a fresh morning. A little shower that we waited out on a bus station came at the right time to freshen up before the final 3 km climb. Then I made a shorter and steeper climb to Šentgotard and - after a doughnut - rode back to Ljubljana. The road form Trojane drops for 20 km, not very steeply but too fast to pedal, so I coasted for almost 20 km. I may well say that was a "mystical feelling of a connection with the road". Riding a single speed obviously engages a bit different muscles, and at the end I felt some strain in shins and hands, but it was well over till the end of the day. All in all this was a pleasurable episode that may become a regular summer pilgrimage. Maybe it will be part of the project to ride to all of the "St Gothard" places of the world? The bicycle has got a lift up. It became a fixie. Not that I am particularly fond of fixies, but one must try it sometime. Few words about the bike and equipment. I tried to change the bike as little as possible so that it remains the one that it always has been - I never had a puncture with this bike for example, so even the tyres and tubes were the same as 8 years ago. However I had to make quite some compromises. First, the pedals were old fashioned ones designed to work with straps and are a pain in the a**e to cycle if you don't use this - as I don't. I changed them for cheap plastic ones. Then there were brake pads. They were totally worn and as I intended to live through this year I had to replace them. 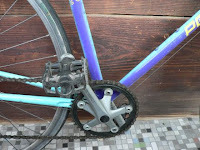 Further, the gears were far from appropriate for mountain tour: 2 front rings (52/42) and a freewheel of 11 to 24 teeth. I didn't want to go for larger cogs, but instead got rid of some parts in order to reduce some weight. So I removed the big front ring, front derailleur, shifter and cables, saving 480 g. Stock bolts were too long for single ring and I couldn't get short ones, so I used washers left over from roof repair. I was sceptical if this would work more then for 50 km, however, to my pleasant surprise the ride with one ring turned out to be excellent show of simplicity and enjoyment - apart from climbing hills steeper than 5%. The bike had other deficiencies as play in the rear axle, play in the bottom bracket and bent rear axle, but I couldn't fix this by myself and didn't want someone else's hand to touch it, so I just went with it. 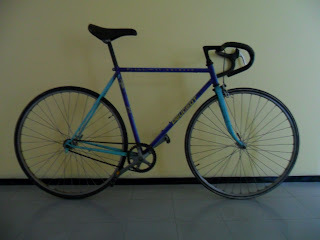 Apart from the pedal that fell off on the third day (probably because of the loose BB) I had no problems with the bike. It was essentially a "credit card tour" - sleeping and eating in hotels. This enabled me to go far below my usual luggage weight - which already is an unbelievable minimum to most of cycle tourers (see the weight page). Beside the cycling clothes and shoes on myself I carried things in jersey pockets, in a small bag on the handlebar and in a bag attached to seat post with bungee cord and supported by bottle cage for added stability. So there were no racks, this also saved me half a kilo. List of things included: cycling clothes and shoes, long trousers, fleece pullover, rain jacket, underwear, gloves, nylon stockings, tools, digital camera, medical kit, sewing kit, razor and tooth brush, skin ointment, card with riding directions (substitute for a map), ID and credit cards, pencil and paper, spare tube, spare glasses and some plastic bags. Total weight: 2950 g, with water in a bottle at most 3950 g.
The weather forecast last evening was shocking. The rain front is approaching southern Switzerland, will be around Gotthard by noon and will last three days. It means there is a strong possibility I will have to drop my plan and go back less then 10 km away from the finish line! At 7:00 it's sunny. I get ready and start around 8:30. It's a bit chilly, I cycle first with rain jacket, then only with "light arm warmers" i.e. nylons stockings. If you pedal hard they are good enough insulation. Oberalppass is an obstacle before the final act. It's only 50 m lower then Gotthard - not a warm up that I would wish at this point. The wind picks up on the downhill part and when I race into Andermatt a few snowflakes are flying around. The skies are gray and menacing, however it's only 14 km from the S.G. and I can't stop now. 4 km later there is road sign where Gothardpass name is taped over - it hasn't been opened yet this year. But the direction is obvious, so I start the climb. It's 9 km up and 690 m altitude gain - an easy stroll in fine weather. After 1 km the rain starts. After 4 km I am totally wet. 4 km from the top the storm is blowing snow in my face. A car approaches from the oposite direction, with a couple of passanges looking at me incredibly, I stop for a moment and think "It's better to go back and start early tomorrow in better weather". I look back, then go 10 meters forward, then another 10, another 50. Fortunately I see a gallery further up, I reach it and rest. It's only 2.5 km to the top!! My hands are freezing, I warm them in my crotch. The top of the pass is rather flat and soon I can see an orange house. Yes that's it, I've made it. I am only one at the top, the pass is closed as well as everything else. I make a quick picture at the sign, then anxiously turn down. The ride down was one of the memorable painful moments. The heat was evaporating rapidly from my wet hands, and every gallery on the way down meant a refuge like coming home. I brake intermittently with one hand, sucking the water out of the glove on the other one. Behind the road barrier I can't see anything, it's total whiteness, I'm riding through the cloud. Could be like heaven if I weren't soaked to the bones. Just before the sign for Airolo there was a steel bar prohibiting the cars to go up, fortunately high enough that I could go under. A few further turns on badly cobbed road didn't intimidate me any more: the snow had already turned to rain, it was recognizably warmer and I had reached my goal. Few minutes later in a hotel lobby, wet, freezing and shivering, I was happy to hear affirmative answer to my question: "Avete camerre con ducha calda?". Day 6: 90 km, 6h 1min. Total: 750 km. I thought of taking a day of rest, but took an aspirin instead and moved on. Very slowly to Lichtenstein, mostly on cycling paths far across fields and away from traffic. Then crossing Rhein into Switzerland and following it on Radweg 2, one of excelently posted cycling paths here. At that point I felt strong enought to leave the path and follow the road to Chur. Then the road left the valley and went up. I was slow on the narrow road and the traffic was horrible. The truck driver that had to wait for a moment behind me was honking and wawing his hand. What did he mean? "Get off the road and go cycle on the bloody Radweg that we biult for you"? Day 5: 126 km, 7h 12m. It's hot here, even if it's only end of April. I am already burnt on my arms and face. I didn't feel good in the morning - probably I'm pushing too hard, beyond my abilities. Today it was flat and easy until the start of Arlberg pass where a storm caught me and I waited an hour and half for it to pass. I had execlent weather until now. After Arlberg there was a big descent in the dark valley with quite few tunnels, but I didn't want to catch the storm again, so I stopped for a beer and to dry up. I can't manage the rain - it's unsolvalble problem for me. Day 4: 136 km, 6h 48 min. Austria is a nice country to cycle. The roads are good, the drivers considerate and the eastern wind is very helpfull, especialy if you are heading toward Switzerland. But one thing could be improved: the availibility of the internet. I had to wait for 3 days to get to one and to pay much more expensive accomodation in big town instead of really pleasant and cheep Ladhaus in some peacefull village under an ubiquituous mountain. Today would end in uneventfull spinning if after about 120 km, at the foot of small ascent my left peddal fell off. As I didn´t take the pedal spanner (as a result of weight saving) I thought that it ment a serious disruption of this tour. However, I was more then happy to notice that pedal had a hole for the allen key, which I had on me, so in 10 minutes everything is back in order. We shall se if the pedal will last till Gotthard. Day 3: 164 km, 7h 05min. Grossglockner Hochalpenstrasse should be opened right today this year. A fine way to start another legendary cycling day. I was warming up for the first flat 30 km up to the start of the first pass - Iselberg, it´s about 8 km and quite difficult. Then it was going down partly on roads and partly on radwegs that followed idyllic streams away from the road and the traffic. Just before Heiligenblut it really starts without introduction. Steep road goes relentlessly up and up. I was not helped with my 42-teeth front ring and especially 24-teeth largest cog. But that´s the way I choose it to be, so I can´t complain. It is also a way to climb the pass, even though I don´t recommend it and won´t repeat it again myself. Briefly, it was pedaling hard for 100 to 500m, then stopping to catch a breath, then repeat. The pass up to the Hochtor at 2504 m is 21 km long, I have broken it with another side pass to Franz Josef Hohe, where the sight of Grossglockner glacier is somewhat sad: the glacier is visibly shrinking and is not a shadow of its past glory. Last 6 km I was cycling (or struggling) between walls of snow high up to 4 m.
On the way down it was squeezing the brakes all the time, more so because there was real danger that a marmot would run under my wheels. There are a number of them sitting right by the road, probably waiting for handouts from sympathetic tourists. Day 2: 108 km, 6h 49 min. This tour I started directly from home. It was not something I am used to, so I missed two early trains to Jesenice (the starting point in Slovenia). By the time I started cycling it was practically noon. The eastern wind was helping me - from the Italian border on I was just coasting effortlessly and everything seemed ridiculously easy. 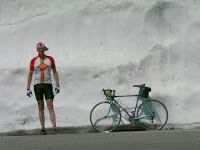 There was a price to pay for it after 60 km - with the start of passo del Pramollo (Nassfeldpass). A real pass of 13 km and at the altitude of 1500 m it felt pretty cold. There were few tunnels too, one of them I cycled in total darkness. The roads I took in Austria were rather narrow and I was a bit nervous with all this traffic moving past me. 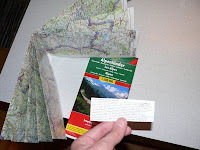 After another smaller Plockenpass I came to Oberdrauburg and found a nice pension. I couldn't fall asleep for long - probably the Grossglockner was haunting me. 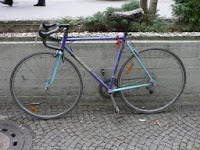 I have an old road bicycle from Peugeot factories with "St. Gothard" written on the top tube. It already has a curious history of its own. Back in 1998 I purchased it second hand in Aachen, rode it to work there for three months (with short trips to Belgium and Netherlands) and then left it in friend's basement with the intention of coming back for another working year. This, however, had never realized. Seven years later I had a business meeting in Dusseldorf. The bike had changed the owner since, but my German friends helped me to track it down in a friend's friend's garage and take it home to Slovenia. The following February, on one of the coldest days of the year, it was stolen in front of my office. But I somehow felt it was not lost forever. Indeed, one month later I caught a youngster riding it and a casual mention of the police persuaded him to give me the bike and continue on foot. its age is starting to show. So, before it totally falls apart I think it deserves the grand finale at it's birthplace - the top of Gotthard pass. That's where I am heading end of April. A story of a bicycle with a name.